Carol A. Chapelle is Distinguished Professor of Liberal Arts and Sciences at Iowa State University, where she teaches in the doctoral program in applied linguistics and technology. Professor Chapelle’s research into technology for language learning has led her into many facets of applied linguistics including the study of grammar and lexis, multimodal communication, language ideology, and language assessment-an exploration that fostered the conception of the field’s first comprehensive, ten-volume Encyclopedia of Applied Linguistics (Wiley-Blackwell, 2013). In addition to editing the encyclopedia, she is co-editor of the Cambridge Applied Linguistics Series, she has served as editor of TESOL Quarterly (1999-2004), and has served as president of the American Association for Applied Linguistics (2006-2007). Her recent awards include the 2012 Lifetime Achievement Award in Language Testing given by the University of Cambridge and the International Language Testing Association as well as the 2012 Samuel J. Messick Memorial Lecture Award given by Educational Testing Service in Princeton, New Jersey. Abstract: Technology is used so regularly for accessing information and communicating that some teachers consider technology a natural part of the language learning classroom. However, technologies that are taken for granted outside the classroom can be a point of controversy when it comes to teaching. Teaching practices should be controversial among professionals rather than accepted uncritically and therefore technology advocates need to be able to articulate the reasons for their advocacy. I will outline five lines of argument that contribute to today’s discussions of the use of technology in language teaching and learning: 1) quantitative research comparing computer-assisted language learning to classroom instruction, 2) needs analysis examining learners’ language and technology use beyond the classroom, 3) qualitative research examining individual language learners’ strategies, 4) discourse analysis showing the distinctions across different genres and registers of language that learners need, and 5) pedagogical principles calling for opportunities to increase language learners’ intercultural competence. Each of the five lines of argument draws upon theory and research in one or more areas of applied linguistics, which I will point out as I describe each of the arguments to show how current work in technology for language learning cross-cuts and contributes to the many areas of inquiry within applied linguistics. Bart Rienties is Reader in Learning Analytics at the Institute of Educational Technology at the Open University UK. The Open University defines its mission as “open to people, places, methods and ideas”. It promotes educational opportunity and social justice by providing high-quality university education to all who wish to realise their ambitions and fulfil their potential. Currently, 240.000 students study at the Open University, making it the largest university in Europe. Within this context, Bart conducts multi-disciplinary research on work-based and collaborative learning environments and focuses on the role of social interaction in learning, which is published in leading academic journals and books. 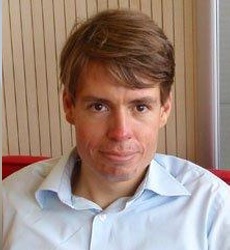 His primary research interests are focussed on Learning Analytics, Computer-Supported Collaborative Learning, and the role of motivation in learning. Furthermore, Bart is interested in broader internationalisation aspects of higher education. He successfully led a range of institutional/national/European projects and received several awards for his educational innovation projects. • If 80% of students learn more from people outside their “classroom”, how can we encourage (in)formal learning? And how would we capture informal learning in learning analytics. • Is data from Virtual Learning Environment systems (e.g., Blackboard, Moodle) useful for learning (analytics)? What else should we focus on to improve our understandings of social interaction? • How can we make learning more personalised, adaptive and meaningful, and what are the implications for CALL? John H.A.L. de Jong is Senior Vice President Standards & Quality at Pearson and Professor of Language Testing at VU University Amsterdam. He has over 35 years of experience in language testing. John graduated in General Linguistics, French and English languages from Leiden University and obtained a Ph.D. in Educational Measurement from Twente University. He has published widely on language assessment and educational measurement and has specialised in empirical scaling and the development of internationally standardised reporting scales of language proficiency. He was involved in developing the Common European Framework from the beginning. Before starting his career in language testing John had been teaching French for seven years in secondary schools. In 2000, after a career at CITO, the Dutch National Institute for Educational Management, John set up “Language Testing Services” to provide consultancy in language testing. Among his clients were corporations, national ministries of education, the World Bank, the OECD, the Council of Europe and the European Union. He joined Pearson in 2006, where apart from directing language testing programmes he is also Programme Director for developing the Frameworks for PISA 2015. Abstract: The rapidly expanding use of Computer-Based Testing (CBT) has brought with it an increasing interest in the potential of computer-based systems to provide improvements in areas other than test administration. One such area involves the development of innovative item types which incorporate features and functions that are not possible with conventional test administration methods. Technology now allows us to incorporate video, sound, increased interactivity and simulation into the items that are developed for examinations. The use of innovative items holds out the promise of allowing us to improve our measurement of the skills that our examinations are attempting to tap into. Innovative item types allow us to measure the same things better than we could previously, or allow us to measure something more, or different, than we were previously able to. This factor is becoming increasingly important as technological advancements lead to ever more complex working environments. Innovative item types hold out the promise of allowing us to, more directly measure cognitive and behavioural skills that are vitally important for the tasks we are asking people to carry out. In this contribution I will discuss the use of automated scoring of speaking and writing as well as the use of virtual peers to address performance skills. Due to health problems, one of our original key note speakers, Erik Duval, has had to cancel his presentation at EUROCALL2014. For more details about Erik Duval, visit his weblog at: http://erikduval.wordpress.com/.